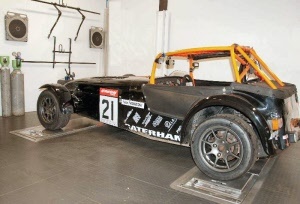 The Caterham chassis is extremely responsive to setup changes and with the regulations for the official Caterham championships ensuring equal car performance, optimising handling is key to getting a performance edge. Whilst the Caterham chassis is fully adjustable at the front for caster, camber and toe, the rear De Dion is fixed and toe & camber alignment requires the use of shims between the ears and the De Dion tube. We have designed and had manufactured Caterham specific toe and camber shims that remain the only available engineering solution to allow consistent and accurate alignment of the rear suspension.